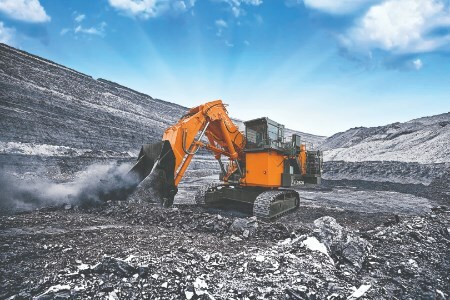 Within the EX2600-7 and EX5600-7, Hitachi’s Fuel Consumption Optimization (FCO) technologies reduce fuel consumption up to 8 - 10% vs the previous models (EX2600-6 and EX5600-6) through engine options and hydraulic system improvements. Customers can choose from a Cummins or MTU EPA Final Tier 4 engine option. For non-regulated countries, customers can choose from a Cummins or MTU engine option that features fuel calibration optimisation settings that contribute to improved efficiency. The new machines also offer features that strengthen their durability. A pressurised cab bed improves the life of electrical components and controllers by using an air filter to keep out dust and debris. Maintenance is also reduced with a greaseless center joint that utilises available hydraulic oil for lubrication rather than needing grease lubrication. The EX-7 Series also provides the option of AerialAngle™, which is popular among customers and works as a 360° vision system. The system assists with noting equipment surroundings through a display monitor that combines a set of images captured by cameras positioned at different locations around the machine. The EX2600-7 and EX5600-7 will be available to the US, Canadian, Latin American and Brazilian markets. Hitachi’s EX-7 Series excavators are manufactured in Japan. Additional EX-7 Series machines will be announced at a later date.